Marshas hadits share of mechanical visitors from Earth. But as of today,NASA's MarsOdyssey orbiter has officially been the red planet's longest-stayingguest. Dec.15marks the 3,340th day since the satellite entered orbit around Mars,passing therecord previously set by the Mars Global Surveyor, another orbitingsatellite.And MarsOdyssey hasn't been idling in space, either. Since its 2001launch, Odysseyhas made a fantastic contribution to our understanding of our fellowplanet,scientists say. "Ourpicture of Mars has changed over the past ten years," Odyssey projectscientist Jeffrey Plaut of NASA's Jet Propulsion Laboratory inPasadena,Calif., told SPACE.com. "And it's due in part to what Odyssey hasdiscovered." Theorbiter's most famous discovery came a few months into the mission,whenOdyssey found evidencefor water ice under the Red Planet's rocky surface. Thisevidence led tothe Phoenixmission, a Mars lander that touched down on the planet'ssurface in May2008, and later confirmed the presence of water there. Aspart ofits stated mission, Odyssey also monitored the radiation levels on Marstodetermine how safe the planet would be for human exploration. Theatmosphere onMars is considerably thinner than that of Earth, and it lacks magneticshielding, both of which protect humans from solar flares and cosmicradiation.Odyssey determined that the Martian radiation levels are 2 percent to 3percenthigher than those on our planet. If astronauts were to visit theplanet, theywould have to take precautions, such as limiting the time they spendoutsideand the distance they would travel from protective habitats. Scientists'understanding of Martian weather has also improved significantly sinceOdysseyset its sights on the planet. Over the spring and summer, dust stormscriss-cross the landscape. Occasionally, they evolve intoplanet-engulfingstorms, visible by Earth-bound telescopes. Monitoringthese storms and other weather patterns over several years hasincreased thestore of knowledge available, giving climate modelers more informationto workwith as they try to determine their causes and effects. 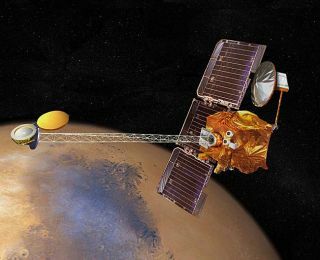 TheMars Odyssey probe completed these official tasks by 2004, when itsprimemission ended. Yet its work continues today. "Wehave met all of our official requirements for the mission, but therearescientific goals we had from the outset that we continue to pursue,"Plautsaid. Oneof the most important goals is the creation of a completehigh-resolution global map of the planet. Odyssey's orbit wasadjustedyears ago so it could capture images of the ground directly beneath itin thelate afternoon. The minerals and rocks in the soil give off the bestthermalsignal between 3:30 and 4 (Martian time), so the orbiter maps the areasat thistime of day, moving slightly with each pass to create a mosaic. "It'slike wrapping string around a ball of yarn," Plaut explained. "Youput each string next to the previous one." The pictures overlap onlyslightly with their neighbors, creating an in-depth map. Odysseyis also continuing to pursue climate research. Over the course ofseveral yearsscientists have monitored long-term climate patterns on Mars using datafromthe probe. Neutron detectors on Odyssey monitor the amount of carbondioxidecycling from the ice on Mars' poles. AndOdyssey doesn't operate in a vacuum ? it often partners with otherspacecraftnear Mars. Its location high above the surface has allowed it to serveas theprimary communication relay for Spirit and Opportunity, two explorationroverson the surface of Mars. Odysseyalso served as a hub for the Phoenix Mars Lander, broadcasting databack toEarth from the craft on the ground. It has also worked with NASA's MarsGlobalSurveyor and Mars Reconnaissance Orbiter to observe weather changesover theyears. Odyssey'steamwork will continue in 2012, when NASA?s next rover, Curiosity,lands. Its position may be tweaked to observe the landing, andafterward, itwill serve along with the Mars Reconnaissance Orbiter to send data fromCuriosity back to Earth. Afteralmost a decade in space, Odyssey is holding up surprisingly well,scientistssay. After an intense solar storm in 2003, the Martian RadiationEnvironmentExperiment (MARIE) shut down. Also, one of the components in the gammarayspectrometer (GRS) no longer functions. However,most instruments are still functioning and Odyssey continues to gatheranabundance of scientific data. In fact, the spacecraft still has abackupsubsystem that has yet to be utilized because the primary systems stillwork sowell. Odysseyis part of a partnership between NASA, JPL, and Lockheed Martin SpaceSystems,with Lockheed responsible for its production, as well as continuouslymonitoring communications from Odyssey. "Thesuccess and durability is a real tribute to the way (Lockheed) builtthecraft," Plaut said. Sohow much longer will Odyssey continue to send information to earth? "Ifyou had asked me 10 years ago," Plaut said, "I would have said fouror five years max." Thatguess obviously would have fallen short. Plaut cautioned about thefallibilityinherent in such predictions before adding, "I don't see any reason wewon't go another 10 years ? as long as we don't run out of fuel orfunding."